Five years ago, collaborative divorce was mostly much limited to California, Minnesota, and Ohio. Today, there are collaborative groups in most states, Canadian provinces and at least eight other countries.1 Although collaborative divorce has proven highly successful in certain cases, however, it has been a disaster in others. A new concept, cooperative divorce, is being developed as a settlement-based alternative to collaborative divorce. The underlying premise of collaborative divorce is to remove the process of dissolving marriages from the litigation system. The theory is that removing the threat of court action will improve the ability of the parties to negotiate win-win settlements rather than resorting to the threats and intimidation inherent in our contested advocacy system. The process is designed to preserve the parties’ relationship following the termination of the marriage, which is especially important when they have children,. In experience, the process works very well in many cases. Economically, by eliminating court dates, the collaborative process can avoid the inefficiency and pressure of trial preparation, adjournments and last minute, courthouse-step settlements. More important, collaborative divorce can minimize the emotional costs for the parties. When the collaborative process fails, however, a financial and emotional disaster occurs, often making the result worse than if the process had never been initiated. Why does Collaborative Divorce not work in certain cases? Some couples cannot afford all the ancillary professionals that ideally are part of the process. In other cases, substance abuse, mental health issues or domestic violence may make the collaborative process inappropriate. Sometimes it might not work because one of the parties needs the threat of court to negotiate fairly or even negotiate at all. Where the process is not appropriate or fails to work, the only other option in most jurisdictions is the standard divorce scenario with all of its attendant horrors. As a result, a group of Wisconsin lawyers have created a cooperative divorce process which maintains most of the settlement-based features of collaborative divorce, while retaining the ability to go to court if, but only if absolutely necessary.3 As with collaborative divorce, in a cooperative divorce the parties agree to work toward a settlement, voluntarily disclose all financial interests, refrain from formal discovery, and use joint appraisals of assets. Unlike collaborative divorce, however – and this is a significant difference – a cooperative divorce agreement is a statement of intent only and is not binding on the parties. What is the purpose of a cooperative divorce agreement if it carries no teeth? First, the non-binding promise to cooperate and work towards settlement helps to dissipate at least some of the mistrust and suspicion that can cause unnecessary financial and emotional costs in a divorce. 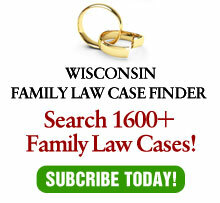 Second, the Wisconsin organization membership provides a list of family law attorneys who are willing to publicly commit their services to resolve disputes by peaceful means. Further, the Wisconsin group offers an annual seminar on negotiations and the cooperative process as well as an early neutral-evaluation program. Divorce cases are not “one size fits all”. Lawyers should have multiple options to offer potential clients in assessing their circumstances. Cooperative divorce offers a new option that might improve the ability of certain couples to end their relationship in a dignified, peaceful manner. 1 – See: International Academy of Collaborative Professionals Web site. 2– See: Gregg Herman, “Collaborative Divorce”, 15 Am. J. Fam. L., 249 (2001). 3 – Additional information on the Wisconsin group is available on the Divorce Cooperation Institute, Inc. Web site. This article originally appeared in the American Journal of Family Law, Vol. 19, No. 3.